Mordian 7th Regiment: 40k Blood Ravens - Character painting begins! Naturally the project began with creating a massive grey plastic mountain of models, and I rather enjoyed building them. Took an afternoon to primer everything and pulled out a first chunk of models to get started with - when in doubt, start with a bunch of characters, right? So far it's mostly been just laying in the base armour colors - I really dig the Gravis armoured captain, and the ancient is rather cool as well. Tons of cool detail to pick out, and while they're a little sloppy so far I think they're going to turn out looking pretty sharp! 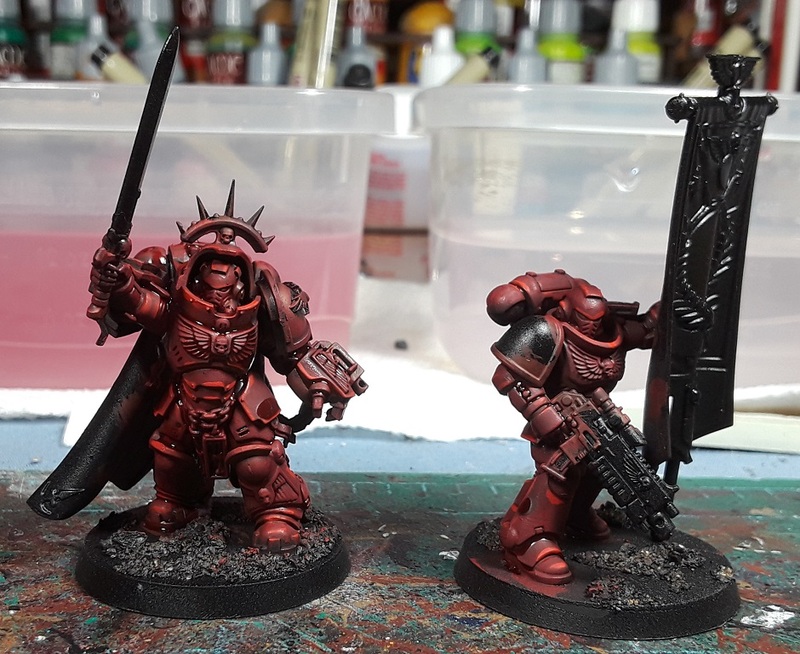 The trio of Chaplain, Apothecary and Librarian offers up the opportunity to work in some other colors, though the robes and tabards in the Blood Raven red should help tie them all together. Again, rather messy so far but they're starting to come into focus! Just to round things out are four Lieutenant models, which are probably too many. I'm actually considering using them as sergeants for the tactical squads instead. The one thing I'm less enthused about with the nuMarines are the mostly-monopose nature of them - With these four I was able to do a little mix-n-match to make them all a little different, but as we'll see in future posts, many of the 'normal' marines end up fairly same-y which is a bit of a bummer. Still, overall I'm rather digging the models, and there's nefarious plans bubbling away in the back of my mind to use them as the basis of some 'true-scale' heresy era marines... Madness! You played any 8th ed yet? Yeah, I know what you mean about GW's newer models - they're better detailed than those of the past, but this all moulded in to allow the chosen post. Which means that you as the customer can make could make half a dozen really detailed great lookin' little men who are all the same. The blood ravens are looking good, there JM ! @NafNaf: Cheers! No games in 8th as yet, and I'm trying to keep an open mind about it but I have to say that some of the streamlining makes me fear it's lost a little bit of the 'crunch' that I like in my games. We'll see! @Zab: Haha! The running gag of course being the bloody magpies steal everything not nailed down. ...They 100% nicked the primaris tech! Yeah the monopose isn't great but they're still gorgeous models. I love your apothecary so far. I got to get me one of them. Red Scorpions without apothecaries is heresy. What is this? Bllod Ravens are linked to Thousand Sons? What now? I might actually like some loyalist chapters. Solid start chief. Still chipping away my 'Sons here. @Monkeychuka: Indeed, they're cool but just don't see myself buying a bunch of 'repeats' as it were. 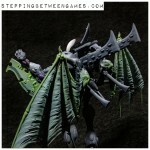 This may be the coolest apothecary sculpt they've done, for sure! @Rory Priest: Aye, they haven't come right out and said it, but there's been a number of nod-and-a-wink references that suggest the Blood Ravens geneseed was taken from the Thousand Sons. They tend to have a higher-than-average number of psykers, are obsessed with knowledge, and there's some naming conventions that with a little squinting suggest they were founded by a loyalist Thousand Sons character... How could I resist? Rapid progress as usual I see! Great stuff, love the blue armour on the Libby, and the set of three look great, black, white and blue, look great together.